A Convenient Seclusion for Knoxville's Urban Wilderness that divides two opposing landscapes that are in close proximity. The chosen site for this unique escape contains three separate land conditions. fields, an un-manicured treeline, and a still water landscape. orientations, the structure accentuates the change in present environmental conditions. Exploring the land, experiencing the Urban Wilderness, participating with the culture and opportunities; the secluded retreat seeks to allow for a place of convenient refuge and relaxation. Nestled within nature and off-trail by under one-hundred yards, and only minutes walking distance from necessary facilities, the outpost balances the practicality of the direct interaction with the opportunities offered within the realm of Knoxville’s Urban Wilderness. 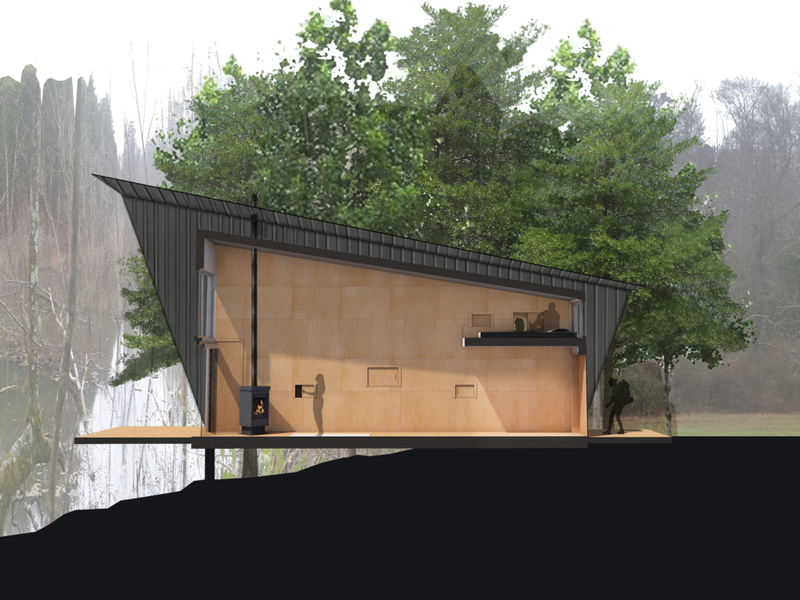 Being in contact with a natural water source that feeds the Tennessee River, the outpost provides a unique experience to visitors that is calm in appearance and soothing to the ear while providing the possibilities within the Urban Wilderness. The retreat is positioned so that it takes full advantage of the chosen site. The rectilinear form emerged to accentuate the existing site conditions. By carving away at the mass of the interior structural form, the height of the structure is extruded for an interior open space and airy experience. To commend the natural environment rather than impede, a tent-like form wraps the perimeter of the structure, acting as a flexible barrier. The barrier allows the land to grow freely around the retreat without hindrance, doubling as a shield to the harsh sun and a filter to the wind, creating a natural cooling system. Just as a tent fly protects from the elements but allows for natural air flow, the wrapping of the form mimics this ideology. The form of the retreat is also informed by the directionality of the site. Spanning from the land over the natural water source, the outpost acts as a bridge to connect the two realms. At both ends of the form, exterior patio spaces can be let down for outdoor involvement, encouraging a holistic interaction with the site. 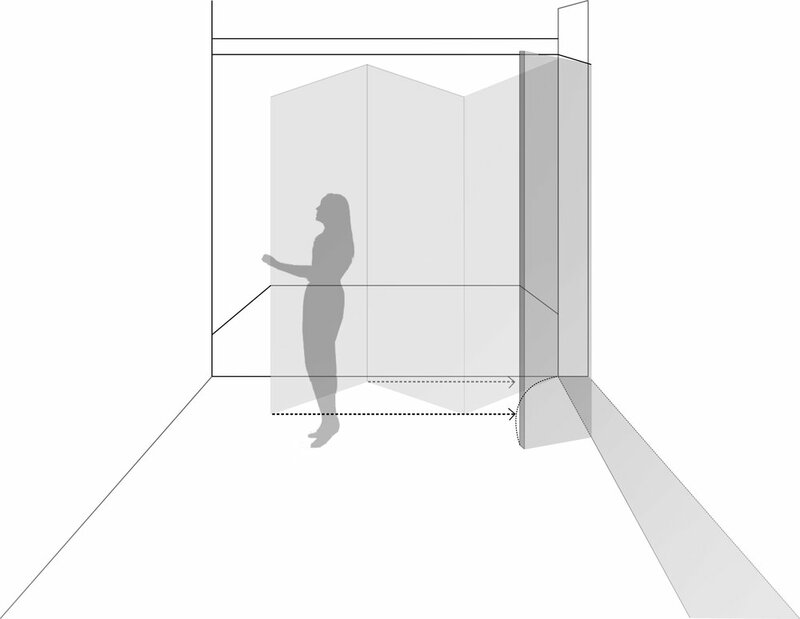 The temporary spaces can also be retracted as desired for privacy, security, or simply enclosure. The southern façade is graced with the faint southern sun as it gazes over the water. The openness of the space leading towards the serenity of the water captures the view across the wetland. In contrast, the northern façade in in direct contact with the open land. It doubles as a secluded entrance. Spanning into the field, the exterior porch draws one into the experience beyond a concealed pivot door. The solitude versus openness naturally draws one across the space. Striving to appeal to an array of individuals, the secluded retreat is designed such that it could house a couple and their child for a nearby getaway, a hunter choosing to relax before an early start the following morning, a small group that wishes to experience and learn about the natural world, a birdwatcher who wants to take advantage of a direct interaction on a prime location, a kayaker who just traveled downstream from one key river to the next, landing by the Forks of the River, and so-on. Only a short walking distance from parking, trails, three state rivers, and a variety of other activities provided by the Forks of the River Wildlife Management and Ijams Nature Center’s urban park, the retreat provides for a convenient seclusion.